Utilities across the country continue to experience infrastructure failures, often with costly environmental or social consequences. In tandem with sometimes well-publicized failures, the 2017 ASCE Infrastructure Report Card continues to give the nation’s infrastructure a “D” rating, with water and wastewater utilities receiving marks of “D” and “D+” respectively — grades that have not improved since the first report card in 1998. High profile failures frequently result in residents and the business community clamoring to fix latent problems before a similar serious failure occurs. To shift from a reactive to a proactive strategy, many utilities are embarking on programs to assess the condition of buried assets and implement rehabilitation projects to extend the life of pressure pipelines. The tools and technologies available range from having no effect on pipeline operation to necessitating that the pipeline betaken out of service, sometimes for an extended period of time. Though many critical pipelines cannot be taken out of service, improved assessment strategies and tools can allow utilities to better target repair-and-replacement projects to focus on the most acute areas. A progressive and continuous inspection process that utilizes broad diagnostic inspection tools across the inventory of pipelines. A risk assessment of each asset that incorporates the likelihood and consequence of failure for each asset. A qualitative, quantitative and detailed description and assessment of the condition of each pipe. As pipeline condition-assessment tools continue to evolve and develop, owners and engineers have increasingly better options at their disposal to provide data crucial to the process of assessing pipeline condition and to making the most cost-effective decision — typically the choice between rehabilitation or replacement. The more information available to predict the remaining service life or the potential for failure,the lesser the risk of proceeding with a selected improvement plan and the greater the likelihood that limited resources can be focused where they can do the most good. A tiered approach for deploying inspection equipment focuses on providing the most important data, in the most relevant locations. By focusing applicable, cost-effective technologies only on the assets where the data is most relevant, unnecessary inspection costs and repairs can be minimized. A progressive approach to inspection can overlap with risk assessment and defect analysis to determine priorities for pipeline condition assessment. Pipeline inspection technologies can be organized using a tiered grouping that moves from least invasive, least detailed and least costly (Tier 1) to most invasive, most detailed and most costly (Tier 3). For many metal drinking-water pipelines, the primary mode of failure is typically due to external corrosion factors and subsequent degradation of the pipeline, which may be manifested by leaks, failures or water-quality issues. Metallic wastewater pipelines are also subject to external corrosion but have the added component of higher probability of internal corrosion issues where hydrogen sulfide-assisted corrosion can occur. Appurtenances, such as air relief and vacuum valves (or the small piping components that connect them to the pipeline), are also susceptible to this failure mode. To assess the condition of such pipelines, one would start by identifying the specific sections of pipe that are susceptible to corrosion, then moving to confirm the extent and location of the deterioration, and finally quantifying the level of degradation and use that to select an appropriate rehabilitation. The following paragraphs highlight which technologies and methods can be grouped into which tier, and how the results can inform the subsequent inspections. The Tier 1 approach is a screening and survey assessment approach to identify pipes that are suspected to be at risk. This non-intrusive method is meant to be non-destructive, with the pipe remaining in service. Examples of Tier 1 activities can include records review, pressure/flow monitoring, appurtenance inspection, continuity testing, stray current analysis, pipe-to-soil corrosion surveys, infrared thermal analysis, and acoustic correlator methods. Tier 1 goals are to identify areas susceptible to corrosion, and/or active leaks, and target areas needing further advanced inspection. Results are used to develop recommendations for continued preventive maintenance and to select assets for Tier 2 inspections. The Tier 2 approach includes more detailed inspections to confirm defect quantity and severity. Tier 2 confirms suspected at-risk areas by employing a semi-intrusive method. This may include exposing a portion of the pipe wall (e.g. excavate a test pit) or inserting devices through existing fittings while the pipe remains in service. Examples of Tier 2 activities can include visual potholing, excavating test pits and subsequent external ultrasonic or electromagnetic testing, and/or deploying free-swimming probes or live-tethered cameras without dedicated pig launchers (a device used to clear the line or inspect the pipe). 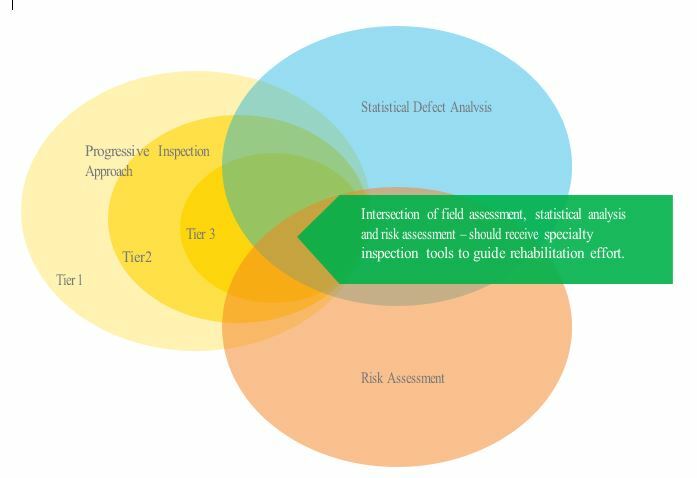 These methods are intended to confirm whether the at-risk areas identified from Tier 1 are exhibiting signs of degradation and provide input to remaining service life calculations. Results are used to refine the recommendations for preventative maintenance, identify those pipe segments in need of rehabilitation, and select pipes for further Tier 3 inspection. The Tier 3 approach involves specialty investigations where more detailed information is required to inform the design of repairs. This may involve destructive testing and/or a fully intrusive method where instruments are inserted through custom launchers. Service interruptions can occur as flow is controlled and/or drained. Tier 3 activities can include deploying in-line inspection tools such as “smart pigs,” dewatering with manual or robotic inspection, and cut-outs, cores or coupons. Tier 3 goals should be focused on locating specific portions of high-priority pipe segments that have degraded and quantifying the extent of degradation. This information can then be used directly for detailed design of repairs or rehabilitation. The tiered approach is intended to balance risk with inspection costs and is focused on cost-effective condition assessment. Inherent in such an approach, accounting for all potential failure mechanisms cannot be guaranteed. It is also understood that many operational force mains cannot be subjected to most Tier 3 technologies, since they cannot be taken out of service. However, this level of assessment can accurately identify the locations with the largest risk exposure and the appropriate specific remediation measures. Using a tiered approach for deploying inspection equipment focuses on providing the most important data, in the most relevant locations. By focusing specific cost-effective technologies only on the assets where the data is most relevant, unnecessary inspection costs are avoided. Applying the tiered approach will allow operators to prioritize pipe segments with the greatest risk of failure to be inspected with more invasive methods,while pipe segments with a lower risk of failure do not undergo such invasive inspection techniques, thereby saving time and money. Dan Buonadonna is Global Technology Lead for global engineering firm Jacobs/CH2M‘s Condition Assessment and Rehabilitation team. 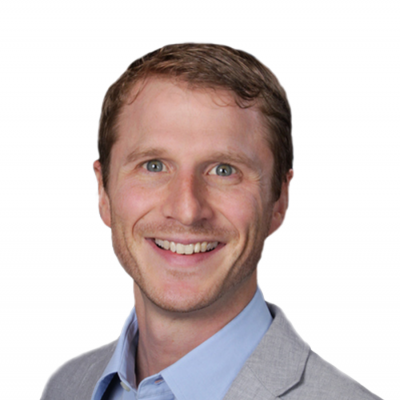 He strategizes solutions for managing aging infrastructure and is dedicated to helping communities face the challenges associated with aging infrastructure and asset management. He is working with EMAGIN as mentor with Aqualyst’s 2018-2019 cohort.